What is declaw on a cat? A declaw, or onychectomy, is a series of amputations. Nail clippers are commonly used to amputate, or de-knuckle, a cats front claws and sever tendons at the first joint. To put it simply, cat’s claws are firmly embedded into bone because they were never meant to be removed! That bone contains claw cells from which new claws would grow painfully and crookedly if the bone was not removed. 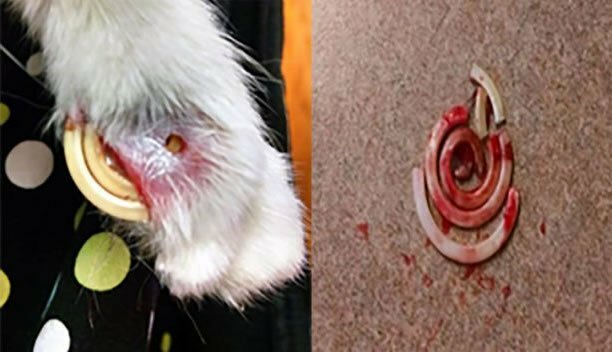 There is no way to declaw a cat except by removing this last bone! Cats are born with claws firmly embedded in bone. They NEED claws to live the healthy fulfilled lives they have the right to live. Loose bone fragments frequently are left behind following the de-knuckling. So walking on tender paw pads feels like walking in a shoe with a pebble in it. Sometimes, the de-knuckling procedure leaves remnants of the nail bed. Claws may grow back again through tender tissue, paw pads and skin, which is very painful. Here is an example of how the remnants can get left behind and cause the nail beds to grow back. is Laser Declaw Surgery More Human Than Clippers? Laser surgery is actually worse than amputation with clippers because it can cause pain and complications from 4th-degree burns. Here are some examples of what the infections look like after laser surgery. New research shows that declawing increases long-term pain in cats. This can lead to behavioral changes such as increased biting, inappropriate urination or defecation, over grooming, and aggression. As a result of ongoing pain from declawing, cats will often choose a soft surface, such as carpet for toileting, in preference to the gravel-type substrate in the litter box. A painful declawed cat may react to touch by resorting to biting as it has no claws left to defend itself with. This is not only detrimental to the cat (pain is a major welfare issue and these behaviors are common reasons for cats ending up in a rehoming center) but also has health implications for their human companions, as cat bites can be serious. In addition, the study highlighted that a declawed cat was also almost three times more likely to be diagnosed with back pain than a non-declawed cat (potentially due to shortening of the declawed limb and altered gait, and/or chronic pain at the site of the surgery causing altered weight bearing). Scratching is a normal and important feline behavior, associated with territorial marking as well as being an important means of defense. Should scratching or clawing in the home become an issue, cat owners can provide appropriate resources such as scratching posts, cardboard boxes, etc. Also encourage cats, via positive reinforcement (use of treats, catnip, synthetic scratching pheromone etc. ), to use these for scratching instead. 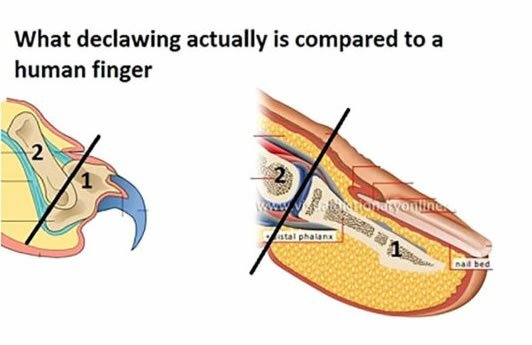 Declawing for anything other than genuine therapeutic medical reasons is totally inappropriate and unethical, and should never be carried out as a means of controlling unwanted scratching behavior.